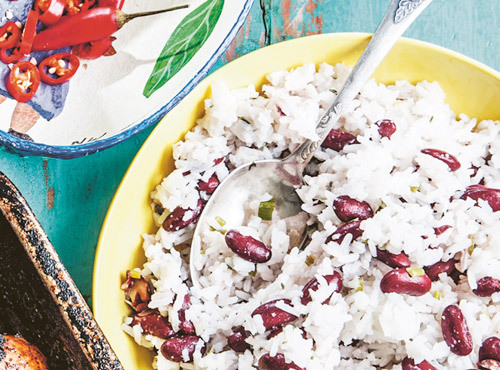 Rice and peas is a much-loved side dish for family meals in Jamaica. There are many combinations of pulses and grains such as this in countries where other forms of protein are harder to come by, and much more expensive, so these dishes form an important part of the traditional diet. Probably every cook in Jamaica has a slightly different version. You will need to soak the kidney beans overnight before proceeding with the recipe. Drain the soaked kidney beans and rinse under cold running water. Put the kidney beans, garlic and water into a heavy-based saucepan and bring slowly to the boil over medium heat. Reduce the heat to low-medium and cook, covered, for 1.5 hours or until the kidney beans are tender, stirring from time to time to make sure there is still water in the pan and the beans are not sticking. Serve in a bowl alongside other dishes. This is an updated recipe from The Cook’s Table. The quantities of rice, water and coconut milk have been amended.